....sorted out for tomorrow, and the arrival of my dad, his wife, my sister and her family, my pals Stewart and Jo. They're all on the boat tonight, so I hope they have a reasonable trip. We've had a three-month battle to sort out Gateside, home of The Radiocroft, as suitable accommodation for my sister shiona, her husband John and their children. Today the redoubtable Duncan and partner in crime Scot provided the essential finishing touches - emergency electrical work, plumbing in washing machine, etc. It's spartan, but warm and I hope comfy. 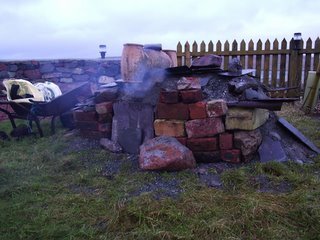 I'm just back from "blacking" the old pot belly stove, and I think it's OK. Here at the Manse, everything is fine I think for our other guests. Susan and Martha have done a fantastic job. all that remains is for me to head for the boat tomorrow and pick everyone up. Then...let the party begin! James Bond is on the telly. Watchnight service in the Hillswick kirk tonight. We appear to have enough to drink and eat. Various children are at home. The dogs are asleep downstairs. Granny's at the care centre, but will be here tomorrow. I think there's enough propane and heating oil. 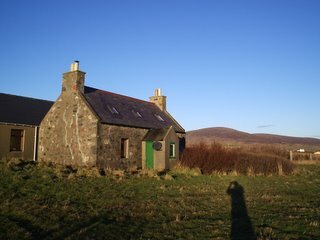 It's been a gloriously mild Christmas Eve, like a spring day, and the Radiocroft is almost - almost - ready for habitation by my sister and her family next week. As for cooking, this is a picture of our oven. Or rather, my hand-built peat-driven field oven, intended for all-night roasting of turkey and goose. Alas, It's turned out to be more of a fridge than an oven. A few design tweaks needed for next year. Have to trust in Calor once more. Anyway, God bless and have a great Christmas. This is my friend Duncan's private aeroplane. It's in North Roe, Shetland. It's a little tricky to explain why Duncan has a four-engine, 16-seat passenger aircraft sitting next to his house. To be exact, it's a French-made Potez 840, one of only three ever manufactured. And yes, he has the wings, the wheels and most of the other bits and pieces. Until a few months ago, the Potez was at Sumburgh Airport, having been used for fire crew training since it crash-landed there in March 1981. Duncan, who has always been interested in aviation, discovered that the aeroplane was to be dismantled and scrapped, and decided it would make the perfect addition to his garden. Much discussion over health and safety, a load of heavy lifting and other shenanigans, there is an aeroplane at the bottom of the garden. It is, shall we say, an unusual sight. Plans for the future include obtaining engines. Working ones. 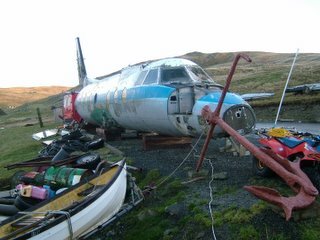 No, it will never fly (the driveway isn't long enough) but the old Potez seems set to become one of the most unusual garden ornaments in Shetland. Or make that Britain. Here's a thing: if in Aberdeen and looking for a taxi, be careful about using Comcab (353535) if you have to be somewhere on pain of death or flight check-in. I had a taxi booked for 8.00 am on Saturday to take me to the airport for the 9.30 flight home to Shetland. Admittedly, it was the morning after the horribly busy office-party-hell-night and it was snowing heavily, but panic set in by 8.30 am when nothing had arrived, despite three calls to Comcab control. I get very tense in such situations, but when the taxi driver finally arrived (from Huntly) I was so relieved I gibbered with gratitude rather than rage. He explained: Desite my having booked the taxi five days previously, I hadn't really booked a taxi; I had simply booked a time slot. Comcab is just a clearing house for individual self-employed cabbies, and unless there are taxis actually out there, your having booked a time slot becomes irrelevant: There was no-one around to pick me up from the (generally very good) Patio Hotel because they'd all gone home to bed after one of the year's busiest nights. Anyway. Got to Dyce, checked in and the flight took off about 45 minutes late, after a delay on the tarmac due to Sumburgh shutting. It was bumpy, but we made it. The drive home to Hillswick was hairy in a small sports hatchback with inordinately wide wheels. But I made it, complete with large quantities of very smelly Ian Mellis cheese. Sunday, and I was back into Lerwick to pick up Magnus from the boat. His first trip home since leaving for uni. The snow had largely melted but in any case I had the Toyota Hilux Susan's currently using following her last accident. It's marvellous - a relief - to have everyone home. Broons fever continues to grow on the eve of their 70th birthday...and the TV documentary on the 30th. I was asked to write a piece for the Sunday Herald on the wonders of Glebe Street, which was published today: embarrassingly inaccurate intro - I'm NOT in charge - but check it out here if you so desire. The best Indian Restaurant in the world? Well, it is according to one of Scotland's most experienced Curryistas, editor of a national newspaper and a man who in his youth used to import spices from the Indian subcontinent to satisfy his desire to create the perfect bhuna. And last night, in Dundee's Perth road, I had what I can only describe as the best curry I've ever had in Scotland. And that's in 35 years of curry consumption. In Wolverhampton, back in the early 80s, I had a truly wondrous tandoori, before the clay oven had assumed ubiquity; In Durban, South Africa, I had a superb lunch in what was then generally regarded as the best Asian restaurant in Africa. But I've never been to Goa, and there's no question that The Malabar in Dundee is heavily influenced by Goanese styles. There is, for example, large amounts of fish on the menu. And, for the first time in my experience of Indian food, offal - the chilli chicken livers were astounding, and the lamb's kidneys with aubergine completely magnificent. If any of this is sounding familiar, then it may be time to mention two magic words - they are 'Gunga' and 'Din'. Back in the 1970s, the Gunga Din, also in Perth Road, was regarded by many as Scotland's top Asian eatery - notably by Billy Connolly. The Malabar sees the triumphant return from retirement of Jacob, legendary proprietor of the Gunga Din, a man who trained as a chef in some of London's top hotels and was on fine form last night. There are some interesting absences at The Malabar - roti, yes, but no nan bread - and it's not the place for those craving the familiar Vindaloo-pakora sandwich. But after last night's meal I was conscious of having experienced something very rare - a truly exciting, satisfying, inspring meal. It was, I have to say, almost spiritual and certainly emotional. Though that may have had something to do with the beer consumed earlier in the Phoenix and Mennie's. It's not plush, it's starkly lit and the tables are formica topped. But it's the best in Scotland, no question whatsoever. Copyright Tom Morton/Zetland Phonographic Industries 2005. All rights reserved. So, farewell to the Barn of Bannocks, which was handy for the hoose, but cold, damp ( despite desperate measures involving storage heaters and three convectors) and echoey. Having retrieved our old crofthouse from an unfortunate rental, we're in the midst of converting it into a bookshop (of which more in due course) with a couple of spare bedrooms which can be used by guests. Notably my sister and her family, who are coming for New Year and my 50th birthday (Hogmanay, if you're interested). So now the Tom Morton Show comes live from The Radiocroft - in other words, the boxroom in the crofthouse. It's warm, cosy, sounds better than the Barn of B and has a window. All things considered, I think it's an improvement.